My wife and I got a new puppy about 3 weeks ago. 2 days after we got her my wife was sitting on the floor with the puppy drinking some cold brew out of a glass. The puppy smelled the cold brew and tried to put her head in the glass. My wife lifted the glass up and away from the puppy, but the puppy tried to climb up her body and then up her arm to get to the cold brew. She cemented her place in the family that day. Yesterday we drove up the coast to a holiday house with some family and friends. This morning I made a round of coffees for everyone and one person out there coffee on the floor next to the couch. The puppy ran straight for it and stuck her face straight in it. Luckily it was a single shot flat white and she mostly just overflowed it onto the floor instead of drinking much as she's just over 2kg at the moment. Does anyone else have a coffee-loving pet? Perhaps cute L3N but very unwise to allow dogs to drink anything containing caffeine, they don't handle it well. dan77 and herbie like this. My wife and I got a new puppy about 3 weeks ago. Don't tell us your kids were running amok at the local cafe? herbie, level3ninja, beensean and 1 others like this. Our cat insists on his milk when we have mid-morning coffee, so we call it his pussycino, although unheated. herbie and level3ninja like this. Thanks Yelta, no plans to let her have any, I was quite worried when she went for the coffee this morning but was relieved to see she'd spilled it rather than drank any. It would not be pretty/safe if she got any! Haha I wish she was free! Animals always have played a big role in our family, at the moment have a much loved and pampered Lab and a very aloof Burmese. Like all Labs Missy loves food, except salad type stuff, cat, Woger, typical fussy bugger, both great to have around. Dimal, herbie and level3ninja like this. Our 2 now departed (aged 13 and nearly 15) Cavaliers were both keen fresh from the roaster bean munchers (only ever gave them a few on roast days) and cup licker outers, the small amount of caffeine didn't seem to do them any harm, the silly one would go a bit zoomier for a few minutes after her beans, but the vet said it was o.k. and they quite enjoyed roast days. The only things they wouldn't eat were lettuce, raw potato, celery and citrus. We now have a new dog, 9 month old Pug x Beagle and are trying hard not to feed her, except out of her bowl, she's too smart and has worked out what we eat is worth getting for herself and she's a determined little miss. Dimal and herbie like this. I have red wrigglers, hundreds of them! They eat the grinds without fuss. They say the coffee grinds slows their eating down, but they going ok.
Haha awesome... our Cavalier just can't stand coffee! Anytime I put my espresso or latte cup near her just to smell, she pulls away, she doesn't like the smell at all! Is it a Coffee Spaniel per chance? coffee_mum, herbie and level3ninja like this. Last edited by Dimal; 3rd February 2019 at 07:18 PM. coffee_mum, herbie, Yelta and 1 others like this. That is valuable information for pet owners. Some things that seem quite innocent can be lethal to our pets. Witnessed what happens to a dog who eats chocolate when an uncle who thought he was being kind to my mum's dog, fed it some Easter chocolate treats under the table. Similar to the caffeine poisioning symptoms in the link but with a seizure that was fatal. Not something you ever want to see again. Last edited by CafeLotta; 4th February 2019 at 09:53 AM. Dimal, herbie, Yelta and 1 others like this. Most unfortunate re your Mums dog, people do things with the best intentions, not realising the consequences, its devastating losing a pet in this manner, have been through it. Thought I put the bag back in the box, must have left it on the floor next to the box. Heard a rustle and a certain someone was sitting next to her bag of food with a dessert request. Dimal, herbie and simonsk8r like this. This is our only claim to a pet. Beryl lives in Borneo and we make a contribution to her support. Dimal, flynnaus, Javaphile and 4 others like this. I had a laugh, cute as. 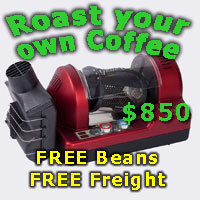 Looks like a giant coffee bean with limbs and a face..
How old is she Rocky, was she orphaned? 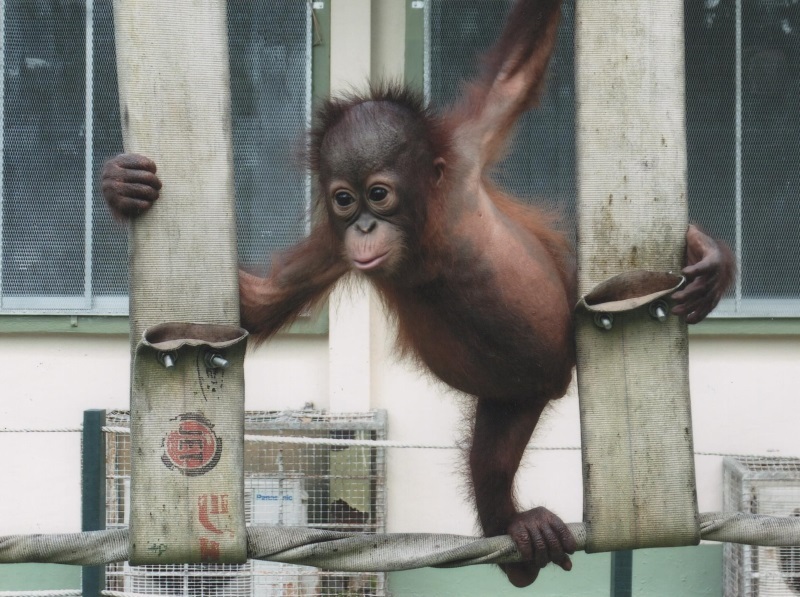 Hi Yelta, she is 4 years old and an orphan and is cared for in Sepilok Orangutan Rehabilitation Centre in North Borneo. The Refuge is funded through Orangutan Appeal UK. Our Daughter visited there recently and took out a 'support' for Beryl as a gift to us as we had been wanting to do this. We will take over when it expires, although of course if Beryl has been released then it will be for another Orangutan. It's a sad situation up there, not sure where it will end, with deforestation and the destruction of habitat it doesn't look good. This household has joint ownership by an old (19 or 20yo in May) dog and a much older "totally blind nowadays" cat. The dog ignores coffee, however I have to watch the cat like a hawk. Her favourite "party trick" is to jump on any potential victim's lap "for a pat" and surreptitiously help herself to any stray lattes - and not just the froth, given a whisker of a chance she will keep going downwards. Doubly strange, and she refuses to drink the same milk "straight". So far she hasn't had enough at any one time to have any side effects however eternal vigilance over one's cuppa is "De rigeur" here. I keep meaning to try her out on neat espresso to see if it is the coffee or the milky blend. Gotta love 'em, even if a very snobby guest was outraged when the cat conned her out of her first two lattes. Amused me anyway and made the visit more bearable than usual. Our Sylvie gets a puppaccino whenever we have leftover milk. She likes the warm milk and foam but often disappointed with the lack of latte art. No caffeine for this one either, being a rescue she is wired enough.